Casseroles, Boxcutters, Jigger, Shaker Classic/Boston, Citrus Juicer, Strainer, Tablespoons, Large Martini Glass, Cup. Prepare the syrup in advance of Brown Sugar, (1 cup sugar 1 cup water), causing it to melt in a pan over low heat. Keep in the fridge. Shaken with ice all ingredients with 1 1/2 Teaspoon of Simple Syrup. Strain into a Large Martini Glass, served after adding some Blueberries. 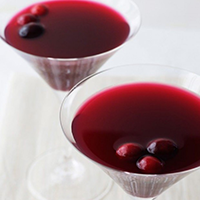 If the cranberry Juice is sweetened, eliminated Simple Syrup from the recipe.